Violence happened during these agitations and morcha cleared that, outsiders or criminal elements had taken disadvantage of the situation. Mumbai: In order to intensify the Maratha reservation battle Sakal Maratha Samaj has decided to establish a political party across the state. Now, Maratha reservation issue has taken a significant turn as the leadership of Sakal Maratha Morcha had kept all political parties at equidistance and never allowed political leaders to lead silent marches. Sakal Maratha Morcha is fighting battle for the demands of community including reservation, changes in the Atrocity act, scholarships for students etc. 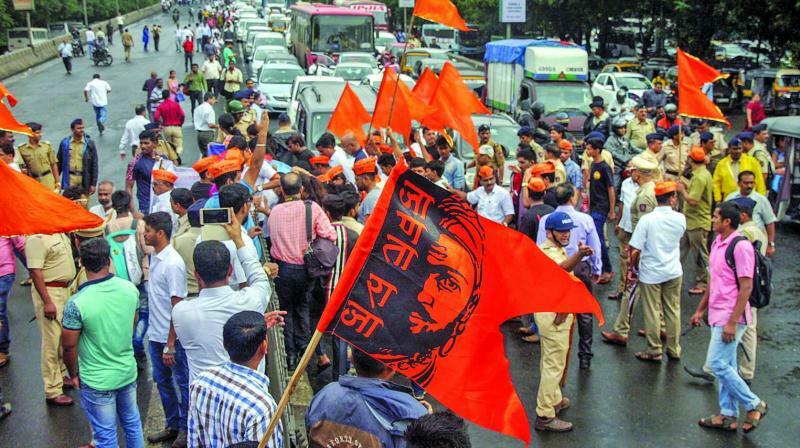 Sakal Maratha Morcha organised 58 very big silent marches in last two years across the state for the demand, but the reservation issue is still pending. These silent marches were very disciplined mostly led by women and all party political leaders allowed participating without any banner of the party to avoid political colour to the agitations and keep all parties equidistance. In last few months, Morcha agitated aggressively and organised bandh also. Violence happened during these agitations and morcha cleared that, outsiders or criminal elements had taken disadvantage of the situation. Now, looking at the upcoming Lok Sabha and Assembly elections, the Morcha decided on Wednesday at Kolhapur to establish the political party.